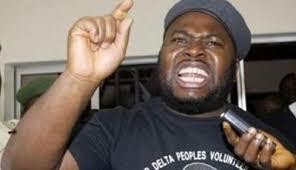 The public should note that I,Alhaji Mujahid Abubakr Dokubo-Asari,Alabo Edi Abali -Abala Buruburu 1 of Kalabari had not entered,directed,appointed or delegated any person or group of persons to negotiate or enter into dialogue with any president,vice president,governor,minister,national security adviser,any committee or institution in furtherance of the nigerian states pretension to the pursuance of peace in the occupied Ijaw,Niger Delta Region and The United States of Biafra(USB). Therefore,anybody who had presented himself/herself claiming to me or represent me in any manner of discussion,fora or conference in furtherance of this pretentious negotiation or dialogue is a fraud and therefore should not be accorded any recognition,as a person representing me,the Niger Delta Peoples Salvation Front and Niger Delta Peoples Volunteer Force. I am convinced and firmly believe that the occupation gambari and their collaborators in the Nigerian state led by general Muhammadu Buhari is not interested in any or in any type of peace in Ijaw,the Niger Delta Region,In the Territories of the United States of Biafra or even in any part of nigeria.The body language of general Muhammadu Buhari is to carry out a genocide and a pogrom against the Ijaw,Niger Delta and the United States of Biafra(USB). Therefore,there is no way I will be hoodwinked to be part of any sham that the government of the nigerian state led general Muhammadu Buhari is masquerading as negotiation or dialogue that will lead to peace in the aforesaid territories….The same way the bride Amnesty was introduced-which I and the volunteers rejected-was used to bribe the faint hearted amongst our compatriots,the cult gangs and fraternities,and the criminal elements in the Niger Delta to allow the our hydro carbon resources-which is our God given and exclusively belong to us- to be freely extracted to satisfy the extravagant and immoral appetite of the gambari and their collaborators…Today most of the recipients of the Amnesty Bribe are full of regrets and wish that they turn back the hands of clock. In furtherance to the above stated reasons,I have no cause to be part of any negotiation or dialogue in the present general Muhammadu Buhari contrived crisis in the Ijaw territories to give him an excuse to carry out his well thought out plan to execute his genocide and pogrom against us….since I am not a member of the Niger Delta Avengers or any of the other internet groups trying to obliterate the shine of the heroic explores of the Niger Delta Avengers….Some people had severally opined that if I am not an Avenger I should publicly disclaim them…Why should I do so?What is my business to be a busybody in this matter?Why should I take pannadol for someone else headache?I will never disclaim,denounce or condemn the Niger Delta Avenger….For I am a known advocate of this truism that for every action there must be an equal and opposite reaction….You can’t sow to the winds and expect not to harvest a whirlwind in return. Finally, the public should know that I am not part of any negotiation or dialogue and had not mandated,nominated,appointed or authorized any person or group of persons to represent me in any dialogue or negotiation with the government of the nigerian state led by general Muhammadu Buhari.My believe is that only a SOVEREIGN NATIONAL CONFERENCE with the resolution for a PLEBISCITE SUPERVISED BY THE UNITED NATION can lead to permanent peace in Ijaw,Niger Delta and the Biafran territories.